I actually managed to get out and go do some fishing last week for the first time in a week or so. I had a scheduled overnighter for wednesday night with John Thompson and friends from west louisiana. 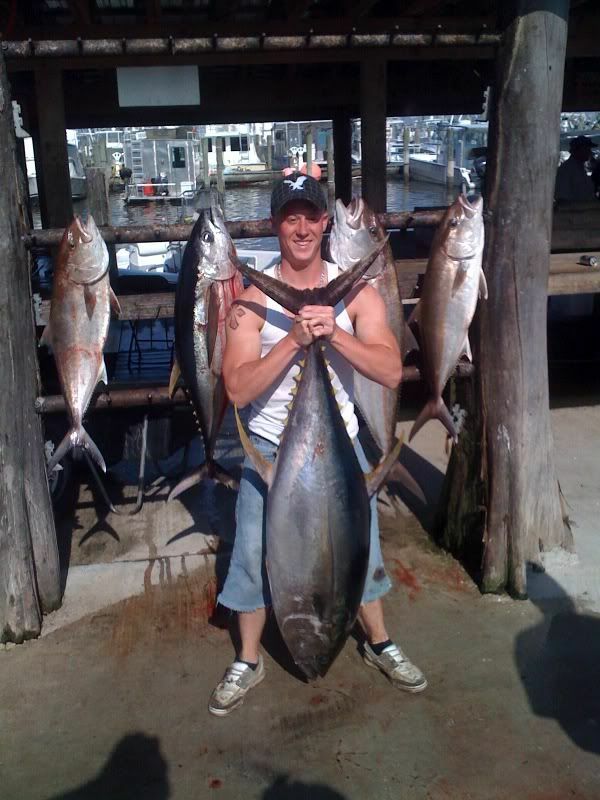 Tuna was the name of the game. We headed out to a bait spot and made a livewell full of tinker mackerals. All between 3-5 inchs long. 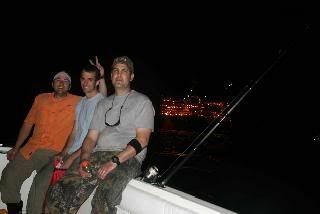 From there we rolled south and hit the first rig with nothign to show for it but 2 undersized yfs. We moved on about 2 miles to another rig and quickly hooked up a triple with two on livies and one on a popper. One of the bait hooked fish escaped but we did put two in the box to start off the trip right. After that it slowed and we only picked up 2 more fish in the next 45 minutes or so. Around 630 I started to notice some fish jumping a little ways in front of me so I repositioned our baits and it was game on with a 50 pounder. While we were gaffing him we had another good hit which would turn out to be our fish of the day. 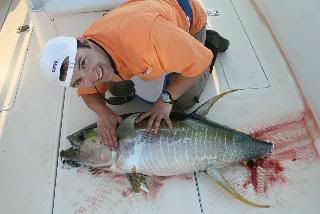 I am guessing it was about 80 pounds before el sharko decided to eat the tail off. I think it was a big mako or a big tiger I didnt get a clear look at it but it was very very large. I did toss our a bottom leader with 300 pound mono to play with it for a little while. 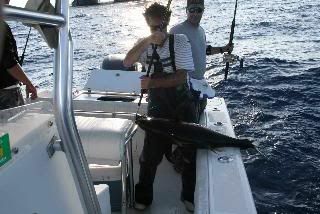 It ate the bait too deep to see what it was but the guys got to feel the power of a 500 pound plus shark before we broke it off. It was around 7 pm at this point and the trip becomes a blue of double headers and we end up catching our limit of 12 yf plus released four more good fish before dark. It was an amazing bite and I think we landed 16 yf in less then 3 hours with 14 of the 16 coming on livies and the other two on OTI popping setups. At that point the guys were tired and decided to call it a trip so we headed to teh dock to start the cleaning job. I rested on thursday and got ready to head back out friday morning with Clay and his friends from Longview. I had gotten a reliable report from a friend of mine about some closer in fish so I was ready to give that a shot. Soon as we got there I saw a swirl and told the guys to cast and they doubled up on poppers. We lost both of them but soon doubled up again and got both. We had some swings and misses and some conversions and put 4 in the box before the popper bite died. 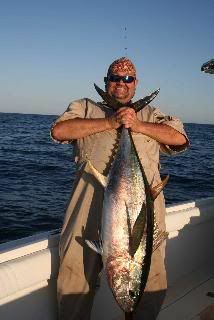 After that we started chunking and put a 40 in the boat and we were fighting a solid fish when ole mako made an appearance at the boat. Louisiana shark season is closed right now but I still wanted to catch it so I rigged up a short wire leader with a circle hook on it and he instantly ate it about a foot from the boat. 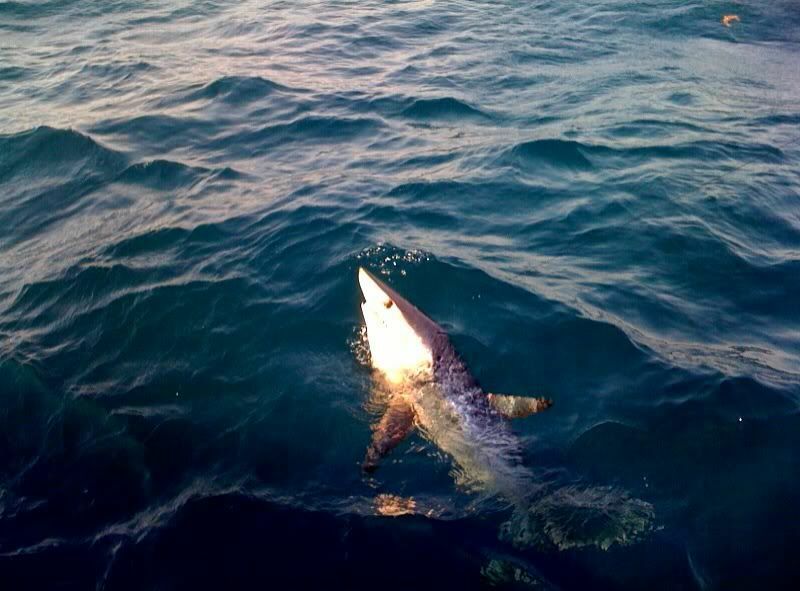 I didnt engage the reel though cause I sure as heck dont want to come tight on a mako a foot away from me. Eventually it swam off and I came tight on it and waited for a jump that never came. Instead the fish dogged down deep. We had a little fire drill with the double up but we got a shot at the tuan first which we popped in the boat. A nice 75 pounder. About 20 minutes later we got the mako to leader and I had some good pics right at the boat before I had some technical difficulties with water and well I dont want to talk about it LOL but I need a new camera. I did snag one photo with my phone though which came out really well so enjoy. The mako was probably 150-200 pounds. The hook actually came out while I was trying to clip the leader so the mako made out well. We went back to chunking about an hour later had a strong bite. 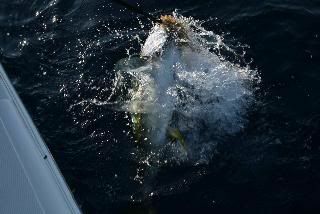 The fish ripped off about 200-300 yards of line straight down on its first run which was foretelling of a long fight. I also had the fish on 60 flouro since the chunk bite was tough. We ended up fighting the fish for an hour and 55 minutes before the leader broke. I had kept bumping the drag up and eventually it gave. No abrasion on the leader just a clean break. I fished on Sat as well with Donnie and his group for his bday. 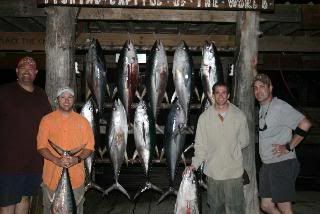 I was amped to get back out there to the tuna but they werent in as good a mood today. I have to give Donnie all the credit. 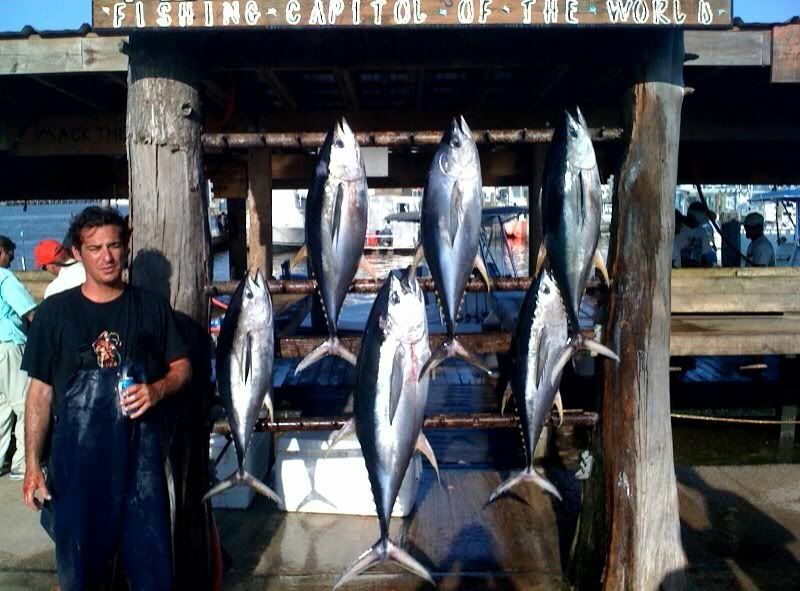 We werent seeing any big busts on teh surface but he stuck with it using the tuna sniper and casted nonstop all day long and it paid off with two bites. One was 40 pounds and one was 90 pounds. 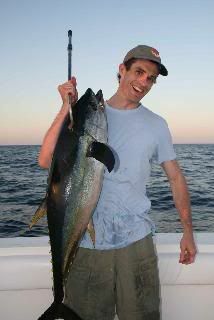 With half his buds hanging over the side seasick we headed in to calmer water and made 4 baits and turned them into 3 ajs in teh fish box. It was fun being back out on the water and I hope the weather starts to straighten out again.